A new word was need in the Czech language for this type and there it is. I had this hat on my mind for a while but only when I got across the Bethany Dearden plaid pattern (can be found here) I knew I had to try it. 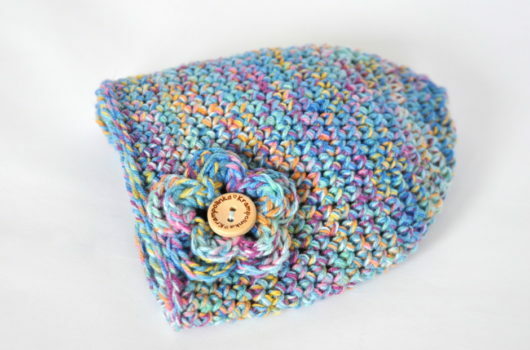 In the original pattern the author starts with a ribbed band but I wanted to start traditionally from the top. Unfortunately I am not a mathematically talented so I had to try it several times before I got the correct size, number of loops and color switching combination. I did not give up so this plaid coolishanka came to world. And as a time saver for others I would like to share this pattern with you. 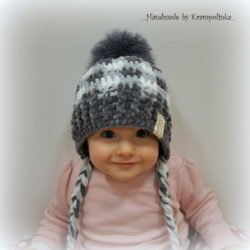 Yarn: Himalaya Baby Dolphin Chenille Yarn dark grey (80320), light grey (80325) and white (80301), have a peak zde. 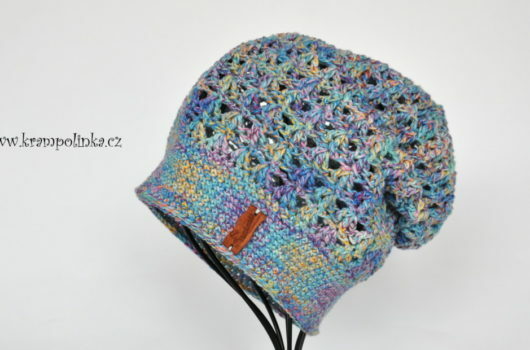 Price to sell this hat is 350 CZK/$14 plus shipping. In this row you always make 2 DC white and 2 DC grey. Sometimes you will have two different colors in one loop from the previous row. At the end please count properly whether you have 32 DC and if the colors are switching regularly. 3rd row: 2 DC, 1 DC, 2 DC, 1 DC, 2 DC, 1 DC, 2 DC, 1 DC, 2 DC, 2 DC, 2 DC, 1 DC, 2 DC, 1 DC, 2 DC, 1 DC, 2 DC, 1 DC, 2 DC, 2 DC, SlSt (32 DC). Do not end with dark grey yarn but continue and crochet 40 FP HDC and BP HDC. That is the beginning of the ribbed band. After 40 stitches TURN and crochet back. Crochet FP HDC into FP HDC from the previous row and BP HDC into BP HDC from the previous row. The ribbed band has 4 rows! 5th row: crochet 40 SC and 8 HDC around the whole hat. 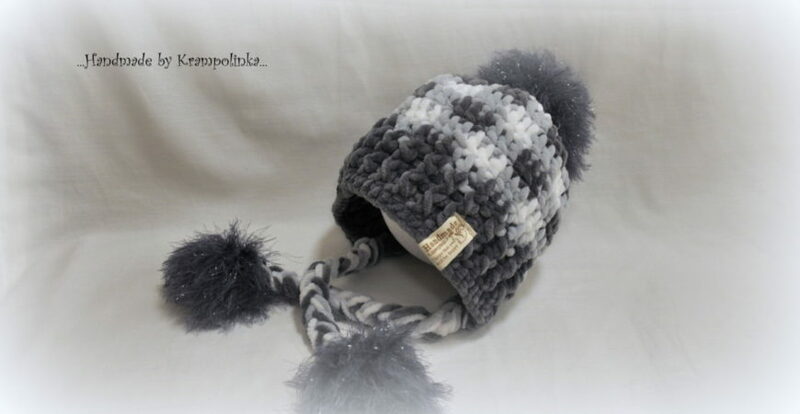 Cut twice approximately 80 cm/31.5 in of dark grey, light grey and white yarn, fold in half and pull through the corner of the ribbed band (where the ears are). Make a braid. Decorate with a pompom. 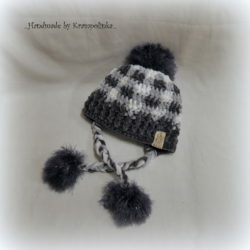 Sew the pompom to the top and sew the button/label to the hat. That it is. 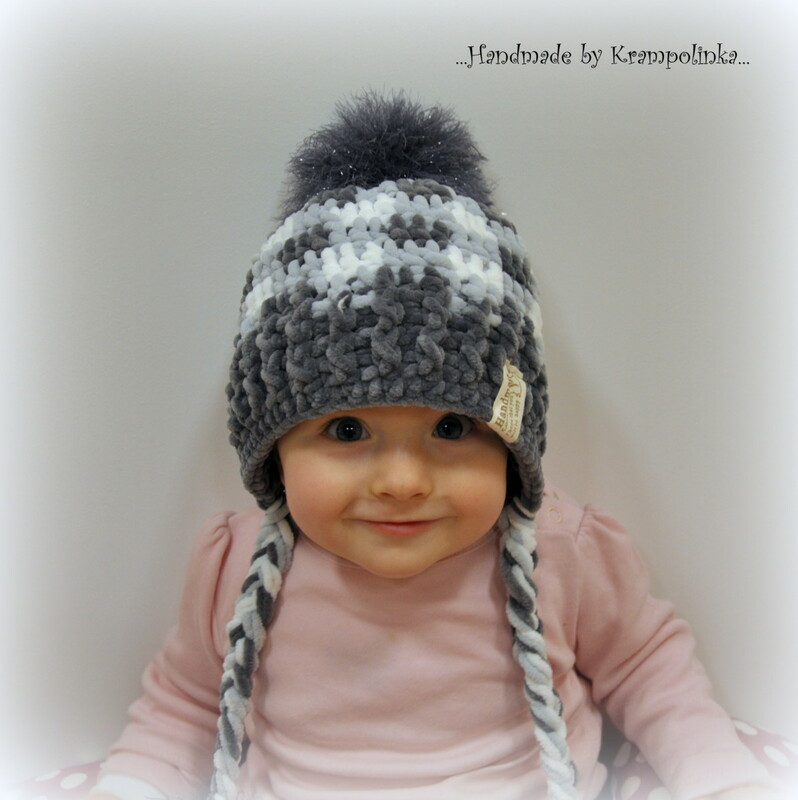 Please click on any advertisement or share this pattern on social network as a “thank you” for this free pattern. 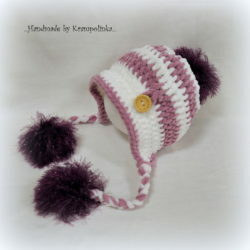 To place an order for this hat or to follow my latest crochet projects please use my FB page Krampolinka. 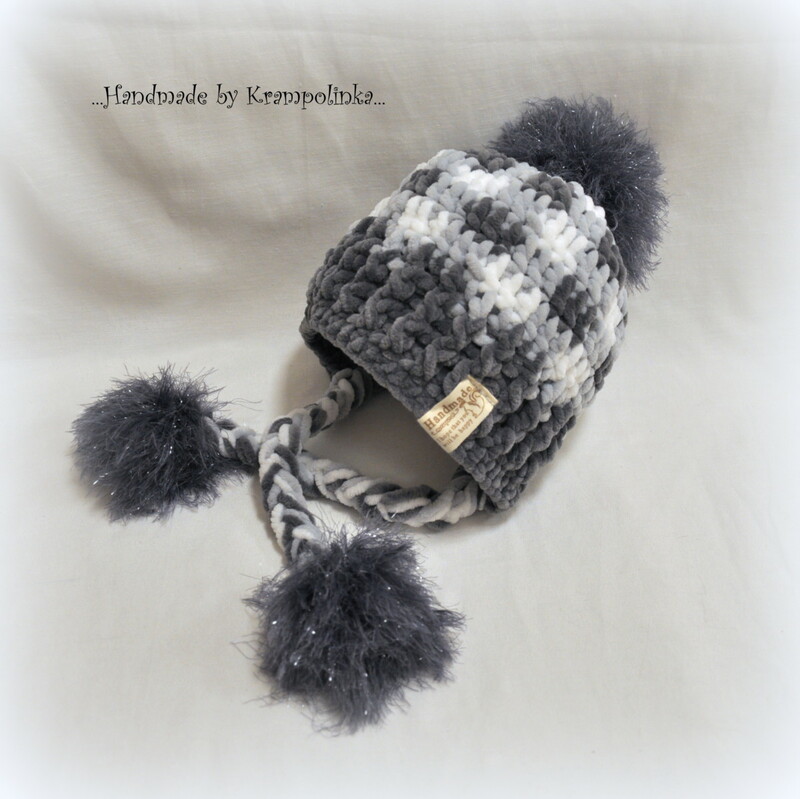 If you like this hat and try this pattern, please share your pictures in the comments for the others to get inspired.